Enhance storage capacity and performance for your mid-tier iSCSI SAN with high-capacity EqualLogic™ PS6100E next generation GbE iSCSI SAN arrays. Maximum capacity: Deploy up to 96TB in a single 4U chassis. Optimized scalability: Take advantage of highly virtualized peer storage for linear performance and capacity scalability. Management flexibility: Manage both file and block storage protocols through one console with EqualLogic Group Manager. Master your data-hungry tasks with EqualLogic PS6100E—high-capacity performance with easy, flexible management for highly consolidated mid-tier storage environments. 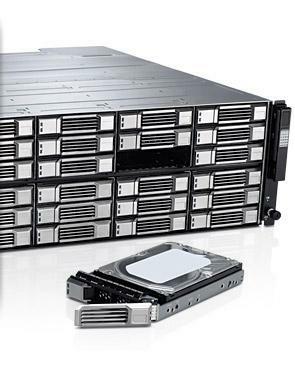 Fulfill your high-capacity needs with the PS6100E GbE internet SCSI (iSCSI) array, a Dell™ Storage solution with a virtualized scale-out architecture that delivers enhanced storage performance and reliability that is easy to manage. Help eliminate manual redistributing of capacity or application workloads (downtime and services costs).